Unhappy with the quality of your digital photo enlargements? Resize your images using BenVista PhotoZoom Classic 6, and get superb results through our patented, award-winning S-Spline technologies! 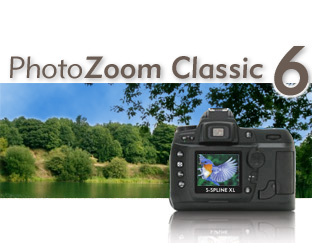 Higher Quality: PhotoZoom Classic 6 is specialized in enlarging photos while preserving quality. Equipped with BenVista's unique S-Spline technologies, this software easily surpasses alternative solutions such as Photoshop's Bicubic interpolation. PhotoZoom Classic 6 also offers a special setting for removing JPEG compression artifacts and noise. Perfect for images originating from the Internet! Easy-to-use Features: PhotoZoom Classic 6 comes with handy presets that are specially designed for different types of photos and graphics. You can also create and save your own presets, using an easy set of fine-tuning tools. The large preview window instantly gives you a preview of the end result, which makes it a piece of cake to determine the optimum settings for the given image. You can even split the preview window into parts, and make a live comparison between different resize methods. Also very convenient are the improved crop features, which allow you to select and resize specific portions of your images. Ideal for spectacular close-ups! PhotoZoom Classic 6 works as a stand-alone application, and supports the latest versions of Windows and Mac OS X, both 64-bit and 32-bit. Conclusion: BenVista PhotoZoom Classic 6 creates image enlargements of outstanding quality and is extremely easy to use. An absolute must-have for digital camera owners and anyone who wants to create great looking image enlargements. World's number one software solution for enlarging and downsizing digital photos and graphics. PhotoZoom Pro 6 not only creates larger images than any other software (up to 1 million by 1 million pixels), it also produces higher quality results. PhotoZoom Pro 6 is equipped with S-Spline Max, a unique, patented image resize technology which excels at preserving clean edges, sharpness, and fine details. Even noisy, compressed originals can be enlarged successfully. Normally, noise and JPEG compression artifacts become disturbingly visible during enlargement. PhotoZoom Pro 6 however offers the tools to eliminate these distortions. You'll be amazed by the amount of detail PhotoZoom Pro 6 is able to dig up from below the mess. 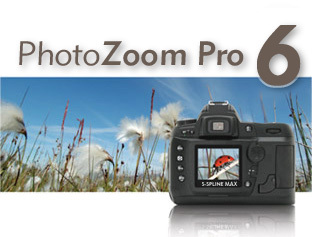 PhotoZoom Pro 6 is extremely easy to use, and comes with various pre-defined settings. These settings can be manually fine-tuned as well. You can even put together your own resize profiles: compilations of your favorite resize method and size settings, which can be selected with a single click. When you often use the same settings, resize profiles will streamline your workflow. Large quantities of images can be resized in one go, through batch processing. Multi-processor support, 64-bit support, and the new GPU acceleration included with PhotoZoom Pro 6 ensure reduced processing time. PhotoZoom Pro 6 works both as a stand-alone application and as a plug-in for various host programs, such as Adobe Photoshop, Adobe Photoshop Elements, Corel PHOTO-PAINT, and Corel PaintShop Pro. Optimized for both printing and on-screen purposes, PhotoZoom Pro 6 is an absolute must-have for anyone who wants to resize images at the highest possible quality.